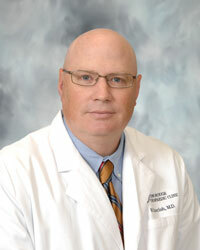 Dr. Eiserloh is now accepting patients at our Baton Rouge Campus. Please contact us at (225) 924-2424 for availability. “Effectiveness of Titanium Mesh Cylindrical Cages in Anterior Column Reconstruction after Thoracic and LumbarVertebral Body Resection”, Spine Vol. 28 (9), 05/01/2003, ppg 902-908. Marcel Dvorak, M.D. ; Brian Kwon, M.D. ; Charles Fischer, M.D. ; Henry Eiserloh, M.D,; Michael Boyd, M.D. ; Peter Wing, M.D. Journal of Shoulder and Elbow Surgery, 2000, July-Aug; 9 (4) 332-5. H. Eiserloh, M.D. ; D. Drez, M.D. ; C. Guanche, M.D. Henry Louis Eierloh, III, M.D. “Analysis of the STIF Technique for Spinopelvic Fixation: Clinical Results in 19 Patients with Neuromuscular Scoliosis” Journal of Pediatric Orthopaedics, Sept/Oct 2000, Vol. 20, Issue 5, ppg 667-76. Andrew King, M.D. ; Kevin Thomas, Ph.D.; Henry Eiserloh, M.D. ; Tara Mills, B.S. ; Deans Pisciotta, R.N., B.S.N.